Ansonia Clock Co. "La Charny", a Royal Bonn clock, ca early 1900\'s. 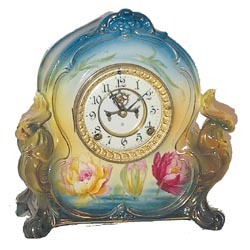 This is another perfect porcelain clock from a great collection of Ansonia Royal Bonn clocks. They spent a large portion of their life inside a glass case, for display only. It is very clean, shining, properly marked, front and back. This case was also molded leaving openings, on each side of the dial, and flanked with sea serpents?, lions head on top. It stands 11 1/2 inches high, 11 inches wide. Finished in beautiful decorator colors, blues, yellow, rose, light green, and tastefully added gold around the edges. Decorated the same on the sides and top. 8 day, gong strike, French sash, beveled glass, 2 piece porcelain dial and open escapement feature. You won\'t find one nicer .Ly-Ansonia No.2546.